Throughout John Steinbeck's The Grapes of Wrath, the author uses spare prose to complement his protagonists' difficulty expressing their needs and desires. Still considered the author's masterpiece, the work is undergoing a critical reevaluation as scholars debate its merits as a universal story of human endurance. The title, John Steinbeck's The Grapes of Wrath, part of Chelsea House Publishers' Modern Critical Interpretations series, presents the most important 20th-century criticism on John Steinbeck's The Grapes of Wrath through extracts of critical essays by well-known literary critics. 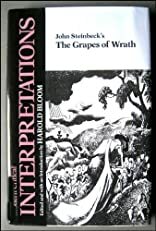 This collection of criticism also features a short biography on John Steinbeck, a chronology of the author's life, and an introductory essay written by Harold Bloom, Sterling Professor of the Humanities, Yale University. About John Steinbeck (Editor) : John Steinbeck is a published author of children's books and young adult books. Some of the published credits of John Steinbeck include Red Pony, Cannery Row.